The amount of uncontrolled hazards Clark Griswold chalks up in his endeavouring to have the most festive house on the block is impressive – but only because it’s fiction. If the scenarios he put himself in were to happen in real life, the outcome would most certainly not be laughable. Griswold must have been channeling the cat that meets an electric demise later in the film because, over his two-day decorating session, he expends most, if not all, of his nine lives. Russ does help a bit, but after awhile, Clark is left on his own. Probably not a great idea for a guy like him. Clark started decorating in the daylight – which is great. Unfortunately, with the amount of lights he needed to hang, his work took him well into the night – leaving him in the dark. This might be the most egregious self-inflicted hazard that Clark endures. For some reason, he thinks it’s fine to be hopelessly tangled in the string lights while conducting work at height. When applying the lights to the gutters and shingling, Clark is pretty haphazard with his wielding of the staple gun. It was good to see that he had protective gloves on, but he could’ve penetrated those quite easily with how clumsily he was aiming the stapler. We don’t see if Clark assesses the weight of the loads prior to hauling them around his property, but I don’t think it’s a stretch to suggest he probably didn’t. Some of the overextending Clark does would be an ergonomist’s nightmare. The guy must be limber with what he puts his body through, but some of those positions are just asking for muscle strains. This is something we all must be very aware of when doing any work around the house in the winter. However, Clark stands completely upright in most of the decorating scenes, despite the precariously slippery positions he finds himself in. Make certain your ladder is locked in its extended position prior to scaling it. Clark somehow miraculously dodges serious injury when his ladder collapses into itself. Clark should consider a career in the circus after this stunt. After placing his ladder at far too steep an angle (not close to the appropriate 75° angle), it topples backward. Fortunately for Clark, the ladder falls toward a nearby tree and he is able to push himself back toward the house. Clark places the ladder against the house and immediately starts mounting it. He didn’t shake it to confirm how sturdy it was or ask for someone to secure the base of the ladder. Nightmare waiting to happen. He is at risk of this many times during his decorating sessions, but he actually falls from his roof into a bush at one point. There is suspect use of electrical cords and outlets throughout the film. In one scene, Clark’s wife Ellen inspects one of their garage outlets where it seems as if 50 cords are plugged into two sockets, in one way or another. It’s amazing their house didn’t burn down. Clark doesn’t really seem to store his Christmas decorations in a tidy manner – that’s putting it lightly. The massive ball of string lights that Russ must somehow unfurl is a testament to that. Those string lights should get a serious once-over before being hung – frayed cords or damaged bulbs could spark a fire. When Clark unleashes a missile shaped ten-foot icicle toward his neighbours’ master bedroom window by hanging off his gutter, that’s not necessarily something you can see coming. However, everyone that finds themselves near Clark when he is undertaking one of his projects should know, within a 50-foot radius, they are in the line of fire. Everyone should stand clear when Clark is aloft. The way he handles decorations and tools so willy-nilly, he’s bound to drop things. I’m sure that’s not a completely comprehensive inventory of all the hazards Clark somehow survives, but you get the idea – he’s a disaster waiting to happen. If only he had the SayleSafety App in his hands, prior to his decorating. Clark’s biggest problem is that he doesn’t plan for success – he just does. If he had a resource that would help him identify the potential and actual hazards, and the controls for those hazards – he would be able to reduce his exposure to risky situations. After all, we want him to stay well, so he can enjoy that pool he plans to install once he gets his bonus cheque. With the SayleSafety App, Clark would be prompted to stop and think about what he’s about to do. He will be coached as to what hazards could possibly be present, what controls can be implemented to prevent harm and he can even take photos. What might really help Clark most is that he can digitally submit his findings to Ellen in real-time, so she can review and decide whether the work he plans to do is safe. A guy like Clark needs a second opinion. As a side-note, after Clark sees how much he can improve his safety and efficiency with the SayleSafety App, he may want to recommend it to Cousin Eddie and Uncle Lewis. They aren’t necessarily the most aware people either, so an app like this may help them have a less explosive Christmas. 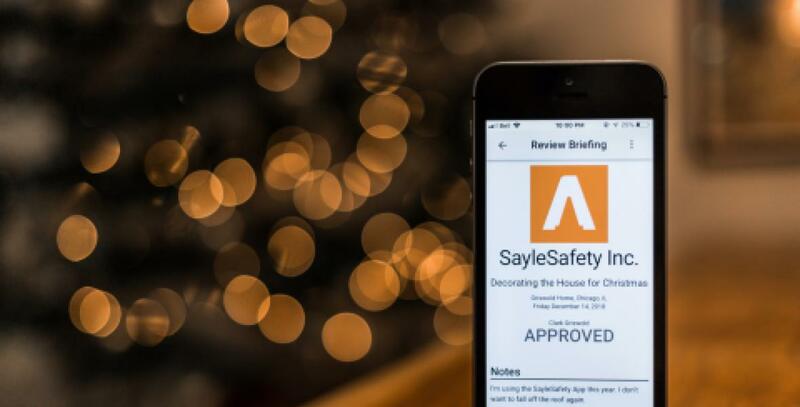 All levity aside – from the SayleSafety Team – we’d like to wish you and yours a safe and enjoyable holiday season. As always, we look forward to furthering the Safety Culture movement in the new year, so more people can have a healthy and prosperous 2019. Everyone’s New Year’s resolution should be to ensure safety is shaped by people.